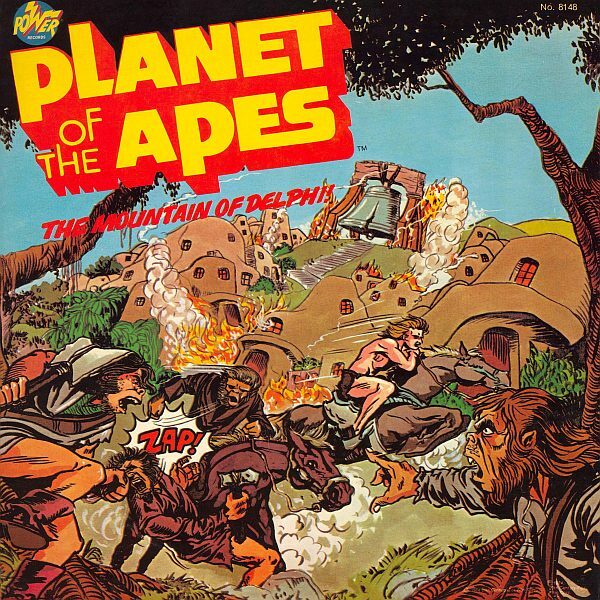 In the upside down world that was the "Planet of the Apes" the divisions and hostilities within the dominant ape community were like a mirror image of the man-ruled world which preceded it. Especially acute was the conflict between the military-minded gorillas and the intellectual chimpanzees, which had been intensifying over a long period of time, and now threatened to erupt into open warfare. Yes, yes. Come in. Come in. Well, don't just stand there. What do you want? Here are the reports you asked for, Dr. Zauis. Oh, just put them down here and close the door after you. Well? Out with it. Out with it. I don't have all day. There is a Dr. Pandira to see you. Pandira? Oh yes. He's the one who has done such fine work in geothermal energy. Not to mention that outlandish theory of his about shifting continental plates. Show him in, show him in. Ah, yes. I know. You thought I was a male. Sometimes I wonder if the world will ever recognize that females are quite as capable as males at being creative, outside of the obvious physiological process of child bearing. Forgive me, doctor. My surprise overcame my sense of good manners. Please sit down. Now. Did you bring the results of your investigation in the Pralox area? Yes. And I am quite concerned about it. The temperature of the water in the crater of Mount Pralox is rising, almost to the boiling point. And the vapor emission has increased sharply. Must we go into that? I've heard your theory, Dr. Pandira, but I really feel you are allowing fantasy to take over your usually rational thought processes. Nevertheless, through my theory of the shifting of those continental plates, I predict there will be a major earthquake along the the fault line in the Mount Pralox district, preceded by massive volcanic activity. Sometime in the very near future. Hmm. Assuming your prediction is correct, the area around the mountain is no longer fit for habitation and everyone living there should move to another and safer location. You realize of course that the Pralox area constitutes one of General Urko's strongest bases of popular support? That it is populated almost exclusively by gorillas? Relations between Urko and myself have almost reached the breaking point. And recently there have been frequent clashes between individual chimpanzees and orangutans on the one side and gorillas on the other. If the Council of Ministers under my instructions evacuates the Pralox area, I'll be unable to predict it's effect on General Urko and his hot heads. The worst fears of Dr. Zauis were at that moment being confirmed at General Urko's headquarters, where a meeting of all his commanders is in session. I have called you together today because of grave developments in our country. For too long now, we have put up with the stupidity and insolence of those emasculated and effete intellectuals in Central City. They have coddled the humans. Allowed our defenses to be weakened. And now are beginning to openly discriminate against us. I have received word that they are about to order the evacuation of Pralox, because of a supposed threat of earthquakes or volcanoes or some such nonsense. It's a trick to split the gorillas! I am from Pralox and my people are not afraid of a few rumbles from Earth. And harmless columns of steam we have seen for years. We will not be stampeded by some chicken-hearted chimps from Central City! Well said, Captain Soma! But the issue has gone beyond all this. The issue now is: who is to rule the nation? Those witch doctors with their mumbo jumbo pronouncements, taken from dusty old books? Or the great gorilla people? You and I. The true protectors of law and order! 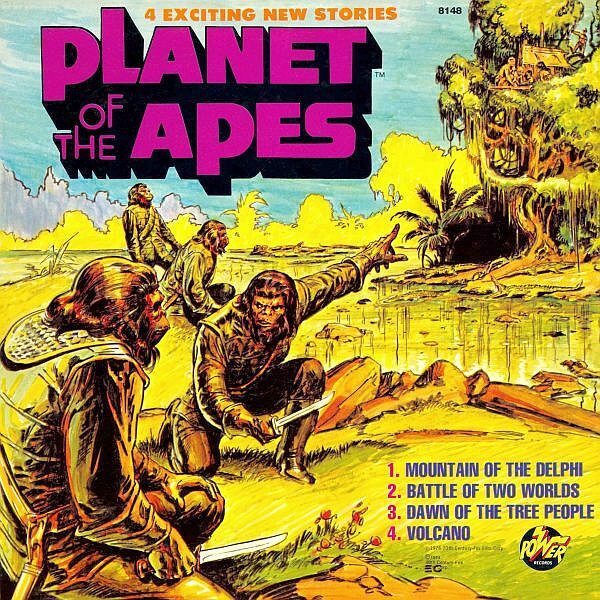 Unaware of the growing feud among the apes, the three fugitives (Pete, Alan and Galen) stand on a lovely hill, overlooking the only village in the pralox area inhabited by humans. If I didn't know better, I'd swear we were near old Yellowstone Park. Yeah. The geysers around here sorta remind me of Old Faithful! But we're nowhere near the Rockies. Rockies? Old Faithful? Yellowstone? I never heard of them. What are they? Well...Hey, look! Something's going on down there. The villagers have gathered around that chimp on that horse. And they look pretty excited. Let's move down closer. Maybe we can hear what it's all about. This is our home! All we have in the world! How can we leave it? And how do you know the danger is so great? We've seen smoke from the mountain many times before, and nothing ever happened. The order to evacuate comes from Dr. Zauis himself. Although Mount Pralox has been inactive for centuries, the scientists say it will erupt at any moment now, destroying everything for miles around. Your lives are in danger. Humans, don't listen to that lying chimp! It's just a trick to cheat you out of your possessions. And I order you to stay in your homes! Guards! Shoot him! Shoot that chimp! And the same thing will happen to any human who disobeys my order. From now on, the gorillas and the gorillas ALONE are running this country. That was Captain Soma, Urko's next in command. So what? One gorilla's about as bad as another when he's got a gun on ya. It is against our law for ape to kill ape. If Urko's top commander deliberately breaks that law, it can only mean one thing. The gorillas are in open revolt! In fear there will be the same kind of fratricidal war that destroyed the civilization of humans. Hey, what's that? Am I dreaming or did the ground shake for a second? You weren't dreaming. And it WAS shaking. And look at that column of steam from Mount Pralox. I don't like the look of this thing! Neither do I. I think Dr. Zauis and his scientists are right. This place is gonna blow. We gotta get out of here. And we've got to convince the humans in that village to leave. They must leave! What a spot they're in. If they stay the volcano will get them. And if they try to leave the gorillas will. If you ask me they have no choice. They've GOT to leave and take their chances with the gorillas. And we've got to convince them! Let's go. They race down into the village and without hesitation Pete climbs onto a box in the center of a crowd of frightened, bewildered villagers. Listen! Listen to me! You've got to leave this place right now. Who I am doesn't matter. Your lives are in danger if you stay here. You MUST leave! You came in here with an ape. Why should we listen to you? Let him speak! My life is at stake here too. And I want to hear what he has to say. Mount Pralox has become a live volcano! At any moment now it will explode and flaming red hot lava will come flowing down, destroying and burying everything in it's path. And that means this whole village. I've seen volcanoes in action and I beg you, leave. Now! It's Captain Soma and his gorillas again! Who are you, human? And what are...say, aren't you...? Guards, seize him! He's one of the fugitive astronauts, and there are his friends Virdon and Galen! Seize them all! Suddenly, with a violent explosion, the top of the mountain blew off! And a fountain of incandescent lava shot high in the air, cascading in showers over the mountainside. And soon the deadly flow of lava began. Let's get out of here! Everybody!! Follow me! Nobody needed to be told to leave at this point. Even the gorillas finally realized that Dr. Zauis had been telling the truth and raced back to warn their own people to evacuate. A little later, on a small hill beyond the reach of the lava, Pete, Alan and Galen survey the scen of devastation before them. Wow! I've never seen anything like that before in my life. The village. Gone! Buried under that river of flame. Looks like the people got out just in time. Thank heaven. They lost everything they had in this world-- their homes, their livestock. But they have their lives. And they can build new homes. The gorillas are not my favorite people. But they are not utterly devoid of reason. Do you think they'll call off their war? Unlike the humans of 2000 years ago, I believe my fellow apes will see the precipice ahead and pull back in time. I think they will learn the lesson of the volcano.